Soldier technology is not a new concept; indeed, we have been providing our soldiers with “technology” since man first understood the need for defence. Early commanders on medieval battlefields had at their disposal a “flag bearer” who would communicate across the battlefield via a series of coloured and marked flags. A very basic and early precursor to today’s modern battlefield radios which are issued to almost every soldier. As the technology has grown, the need to understand better how to integrate it and how to use it to better interoperate with partners and allies has grown significantly. In those more simplistic times of sword and shield the battlespace was more often than not a muddy field somewhere in northern Europe and the day’s work was likely over and done within a matter of hours. Today’s operational space is much vaster and the burden we place upon our Soldiers is a great deal more complicated than waving a flag while chasing someone around a field in France with a sword. As we continue to load our soldiers with more and more technology in an effort to decrease the physical and cognitive burden; something it has arguably begun to achieve well, it has also begun to create a potentially more complicated challenge, namely how to support it. The need to continually integrate will always be present. Utilising current “dumb” hub technology has achieved much of the basic technical integration and allowing devices to share power and data. Dumb being defined as routing power and data only and requiring a high degree of technical input via the EUD from the user to configure individual ports, assign IP addresses and generally maintain a network. However, it has done little for the physical integration, often requiring users to route cable upon cable though their carriage solutions which in turn limits their freedom of movement and increases the weight of their overall load significantly. A new generation of hubs, (both dumb and smart) are emerging that allow for many of these cables to be routed inside load carriage solutions. Significantly reducing the amount of weight and sheer bulk being experienced by many users currently. Whilst the evidence for smarter, lighter, better integrated systems is readily available, there still remains a reluctance in some quarters to bring this capability into main stream use. In part this is driven by cost, but also by logistics and through life support. Delivering a capability into any end user group is one thing, funding it, maintaining it and supporting it is something else entirely. And this is where the next great challenge is beginning to emerge. When it comes to load carriage and putting equipment on the Soldier you are entering into a deeply personal realm. Each user has different needs, different body shapes and different requirements of their load carriage and associated technology. Ultra Electronics have taken steps to tackle these challenges head on and early in the development of the UltraLYNX Smart Hub. UltraLYNX represents an evolutional step change in the development of smart, scalable, soldier worn technology. Not only is the hub smart and allows for the simple plug and play of a range of common (and some not so common) bearer and end user devices; The hub itself can be employed in multiple roles, configurations and carriage solutions each as the user requires. By empowering the user to employ the UltraLYNX hub and cable harness as they need, and dependent upon their role and/or mission, the system becomes a great deal more personawl and can adapt and evolve with the changing situation on a modern battlefield. The user is free to utilise the capability provided by UltraLYNX regardless of the threat level posed, be that in full, high threat body armour, a simple pouch attached via MOLLE to belt kit or light tactical vest, or as part of a wider comms fit inside a daysack. By making the system fully adaptable, UltraLYNX tackles head on one the chief problems with soldier worn systems, namely forcing the soldiers to employ the systems only one way. UltraLYNX puts that power very much back into the users’ own hands. Addressing the issues of logistics was one of the key design drivers for the UltraLYNX Hub. 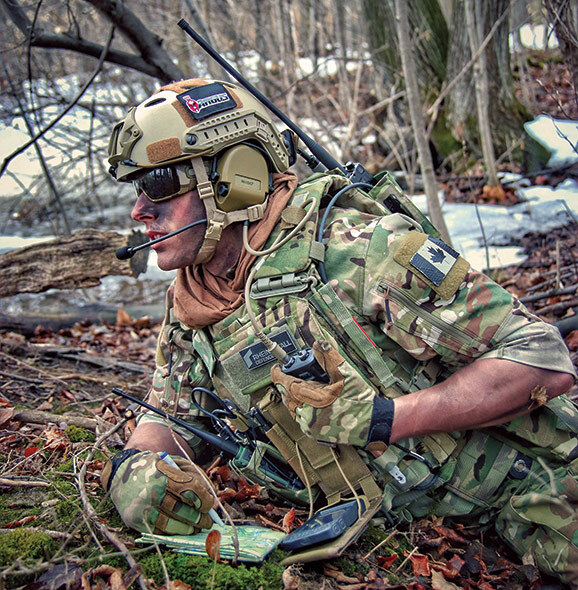 To provide versatility and flexibility of use by the soldier, environmental robustness and closely followed by through life support requirements. It is no good having a game changing solution that has to go back to base if a connector fails. First line repair was a key design requirement, to ensure system availability was built into its design. Allowing the hub and harness to be removed from body armour and load carriage as the carriers reach end of life allows for storage, maintenance, software updates and data interrogation to be handled much more efficiently and cost effectively. Importantly it also enables managing any data at rest issues by bringing each hub back into a secure environment after use. 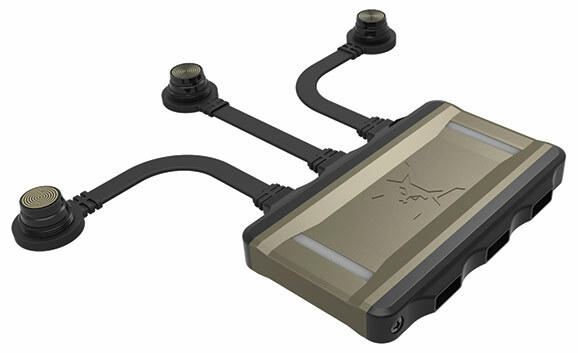 By giving the soldier the flexibility to employ smart SWPD (Soldier Worn Power & Data) technology as they need it; Coupled with the ability to field repair the hub, connecters and harness cables by a simple mechanical release within the vest, UltraLYNX has taken SWPD to a new level of scalability, dependability and flexibility. With Argus NG, Rheinmetall Canada created a modular soldier system which can be accurately customised and ready to deploy to meet the forces needs today. For the first time in soldier system solutions, the focus is taken off the hardware and placed on the soldier with a system designed to augment their situational awareness and decrease the effects of physical burden and cognitive load imposed by modern warfare. Argus NG s engineered by soldiers for soldiers, with usability in mind. An open and flexible system. The high interoperability of Argus NG creates major advantages for the modern military market including an increase in operational tempo, maximization of military efficiency, and better use of existing capabilities and investment, among others. Visit the Rheinmetall and Ultra Electronics booth at Eurosatory to learn more about Argus NG and its unparalleled advantages.